This philosophy was tested to the hilt by the harsh realities I lived through when I went to study in Poland. Within a few months of my arriving in Warsaw, the workers' uprisings had occurred in Gdansk. The violent suppression of these movements led to the founding of the Committee for the Defence of the Workers (KOR), a social democratic movement of artists and intellectuals. It was impossible to be a young artist in Eastern Europe at the time and not be drawn in some way into these movements. I was politically non-conformist by nature, but found the combination of bright-eyed democracy, intelligence, wide knowledge, creativity and compassion irresistible. I had a live electronic, "intuitive music" performing group with an experimental artistic agenda rather than a political one, but we nevertheless became - almost in spite of ourselves - a focus for opposition social movements and even demonstrations and riots. These movements were eventually to transform the political map of Eastern Europe as KOR became the brains behind the brawn of the Solidarity movement. My interest in human rights continued as I began to be invited to work in the Soviet Union. I was never "anti-Communist" but I worked hard in the 70s and early 80s to support Soviet experimental composers and new music. The difficulties for composers were more to do with professional issues, personal power and aesthetics than politics, but they were certainly a matter of human rights. In the later 80s I worked with composers David Matthews and Michael Berkeley (now Lord Berkeley) to support Vaclav Havel and Citizens' Forum. Musicians were at the forefront of reform movements in Czechoslovakia, and David, Michael and I helped defend the Jazz Section of the Musicians' Union when they came under attack from the regime. Some of us involved in this action became founder members of the "Club of Prague". I knew Bosnia-Herzegovina well, and when the war broke out I could not bear to listen to the lies in the media (a civil war, a Muslim government, a hotbed of Islamic radicalism at the heart of Europe) and could not watch my friends dying on television. The Club of Prague encouraged me and directly supported me in the action in Bosnia. Did you leave with any specific plan? 3. to make contact with Vedran Smailovic, the Cellist of Sarajevo to respond his appeal for solidarity from musicians. We were successful in all three. We got Lagumdzija to Washington in March 2003 in spite of attempts by certain international powers to blockade him in Sarajevo (a very dirty game - someone, some day has to dig up the drains on all of this). Ricky Demarco and I eventually brought the Obala artists to Edinburgh and London in 1994 when my opera "Sarajevo" was performed by Opera Factory on the South Bank. And I played with Vedran in the ruins of the Skenderija stadium in January 2003 on the front line in Sarajevo; we remain the closest of friends. What was the situation like when you arrived in Sarajevo? It is difficult to explain what a Medieval siege of a modern city looks and feels like. War is an ache in the pit of the stomach; it is a desperate look in the eyes; it is the dull thud of detonations, sparks in the sky, the smell of munitions and the burning of toxins and flesh. I remember the day before flying into Sarajevo meeting Martin Bell in the street in Split. "Where are you going? ", Martin asked. I replied. Martin turned white and turned away. On the French Hercules we were strapped in flak jackets and helmets into the sides of the cargo area. As we plummeted to avoid anti-aircraft fire, grown men cried - they were the experienced ones. In Sarajevo shells fell at random and the snipers in the hills shot at every street crossing following the Miljacka Valley. There were bodies and sometimes bits of bodies. But there were surreally beautiful things. With little or no water, people kept themselves scrupulously clean, wore smart clothes, had wild, crazy parties when someone found food or drink, played concerts by candlelight and held vernissages for exhibitions. Above all they supported one another. Throughout the siege, Sarajevo remained a city of four religions and no sectarianism - a city defended by its culture. Describe your work with the city's children. The first phase of my work in Sarajevo was focussed on human rights, politics and trying to find ways of stopping the genocide and defending people of all faiths in Bosnia from atrocity. As we failed at the political level, I became more and more aware of the worsening horrors of day-to-day life, particularly for children. I realised there was something we could do that I knew how to do. To cut a long story short, I talked to artist friends in Sarajevo and realised that they had plans to use creative arts to help children in the city, but did not have the means or the energy (as they described it, they were "walking skeletons") to put it into practice. So we went into collaboration. The very first project was with a group of young people we brought together on the highly effective Sarajevo "bush telegraph" (there were no schools open, no phones, no electricity or conventional communications). 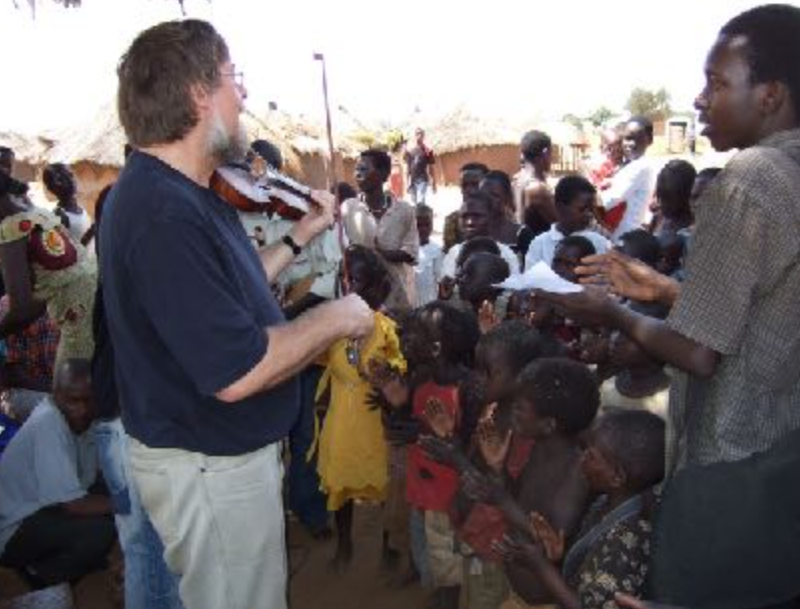 I worked with poet Goran Simic and the Sarajevo string quartet, supporting the children in composing songs. The words were full of dark humour: "The end of the war is running late. It should have been over by quarter to eight. I don't want to arrive in a new era, locked inside an armoured carrier". The music was modal minimalist and would have made Gorecki cry his eyes out. Later I carried hand-held percussion instruments into the city in a rucksack - by this time I was walking over Mt Igman and crawling into the city through the "tunnel" - a drainage channel that ran under the airport. Increasingly we worked on songs, world music, movement and creative percussion, searching for the deepest, Austro-Hungarian cellars to work in where the children would be safe from the shells. We began to craft emotional journeys in music. Although we were not aware of it, it was where the therapeutic work began. We also mounted some large-scale events. 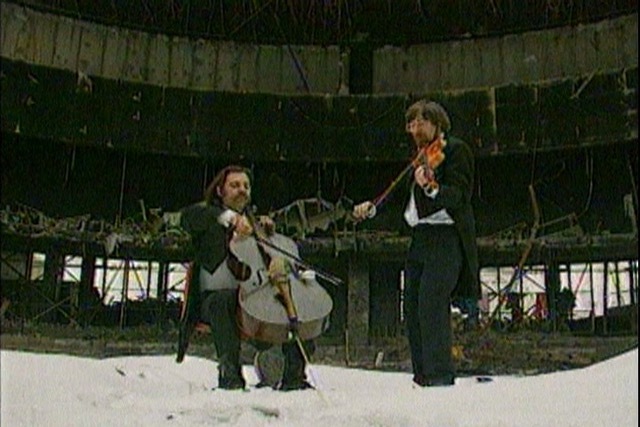 During a ceasefire in 1995 we put on the opera "Evropa" in the National Theatre with a cast of 50 children, opera and rock singers and the War Philharmonic. It was the first opera of the war. We were supported by Robert Barnett who had bravely volunteered to be a wartime UK Ambassador in Sarajevo. Bosnian President Alija Izetbegovic said the opera was a "turning point" in Bosnian�UK relations. We also created a production of "Alice in Wonderland" in the Chamber Theatre - a sort of parable of besieged Sarajevo, where the audience travelled through a tunnel and a pool of tears to arrive at a crazy, cruel party ministered to by White Rabbits and Mad Hatters. How did this project develop in Bosnia-Herzegovina after the war? A turning point came for the project when a representative of what was left of the Bosnian Ministry of Health visited one of our projects. He encouraged us to develop and expand the work, saying he felt it had real therapeutic value. We had never used the word "therapeutic" before, but now we felt permitted to do so. I had always felt that our projects in Sarajevo were "drops in the ocean", almost dangerously tokenistic at times. So when the opportunity came, I was glad and indeed relieved to start a programme that reached the whole of a population of children. I had known Mostar well before the war. According to UNICEF, the children had suffered the highest level of trauma in Bosnia during the conflict. 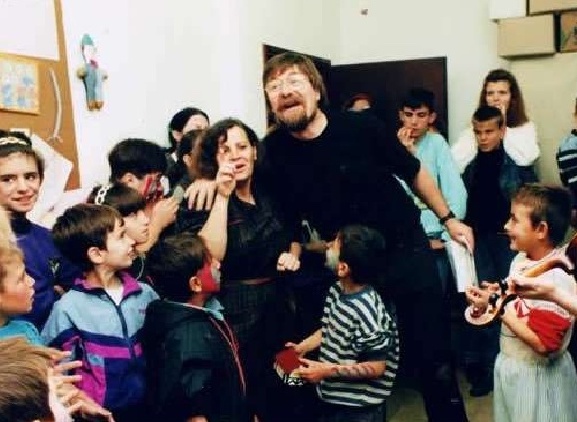 I had been approached by the charity War Child to help them develop a music programme in Mostar, and from 1994/95 was able to set up projects in schools as they were being rebuilt by the EU. There were no arts teachers left - all dead or gone - so I offered the Neretva Canton education authorities workshops that would take place during creative arts "hours" in school, would address the wartime national curriculum in the arts (which was admirably ambitious and visionary), and would also offer the children "therapeutic" activities and experiences. I recruited a team of young animateurs - demobilised young soldiers who wanted to be creative again, and those young people who had been trapped in the cellars of East Mostar dreaming of a better life while being subjected to the worst bombardment of a civilian population in history. Most were keen to sing, so I based our programme around song. Later, as the war ended, I invited my students from Edinburgh on placement as musical peer support. At the height of the programme we were reaching 3000 children a week; a programme that was intended to last a couple of years lasted, by popular demand, for ten years. It led to the building of the Pavarotti Centre in Mostar, to the establishment of the world's first music therapy department devoted to post-war trauma, and to cascaded projects in places as far apart Sarajevo, Tuzla, Trebinje and Srebrenica. Now the project has evolved into a special education initiative and is the hub of a network active throughout the Balkan region. And how has it expanded to other parts of the world? The project expanded entirely through personal contact and by invitation. I was closely involved with the arts world in Georgia, as was one of my former students and later wonderful colleague at Edinburgh, Marina Adamia. These close contacts led to work with children who were victims of the conflicts in Ossetia and Abkhazia in the later 1990s. We partnered with the Tbilisi Academy of Music in a street children's project, and with a local NGO Atinati in Zugdidi. When the ethnic cleansing began in Kosovo, War Child Netherlands were approached by the Doen Foundation to set up a programme for Kosovar refugees in Albania. We accompanied the refugees back to Kosovo and helped establish a local NGO, World Child. Similar invitations came from CPCD (Centre for Peacemaking and Community Development) and Little Star in Chechnya, where we were able to support local volunteers with training programmes and work in the community. We had invitations from many local NGOs around the world - organisations that had simply heard good reports of our work (interestingly, other than M�decins Sans Fronti�res, we have never been approached by the larger international NGOs). This has led to collaborations with organisations such as Art for Community Development in North Uganda, The Children of Amal and the Palestinian Union of Social Workers and Psychologists in the West Bank, SAWA for Development and Aid in Lebanon and Syria, Vidya Sagar in Chennai or the Sri Aurobindo ashram in Pondicherry, India. The project that started from humble beginnings during the siege of Sarajevo is now active on all continents, including the USA and South America. It has also expanded its activities in terms of the scope of the work. In Lebanon, for example, our music programme is at the centre of a holistic development including education, shelter, health, social care, family outreach and food security. Our musical work with children brought with it responsibilities. We had seen the powerful effects that the work could have on children - in their presentation, mood, motivation, socialisation, and in simple things like sleeping better. It became a sine qua non to try to find out why - in order to optimise our dialogue with health and social services and of course to develop the work to maximum effect for the children. Fortunately for us, our discoveries coincided with rapid developments in areas such as music medicine and music neuroscience, related in turn to advances in brain scanning techniques and endocrinology. I was also lucky to be part of a nexus of biologists, psychologists and musicians at Edinburgh and internationally (including major figures such as Colwyn Trevarthen, Stephen Malloch in Sydney, Daniel Stern in New York, Bob Turner at the Max Planck Institute, Maya Gratier at Paris Ouest, and Jaak Panksepp in Ohio) developing the theory and practice of Communicative Musicality. These various strands of new knowledge enabled me to put together a series of models or paradigms for the work, relating the effects of music to the experience of trauma. For example, PTSD causes a significant increase in average heart rate; music may regulate the heart. Music may help regulate breathing and the kinds of autonomic and endocrine activity dysregulated by traumatic experience. The simplest of the models take a bio-psycho-social approach, progressing in a circle from biological considerations such as regulation of heart rate, breathing, the autonomic system and the endocrine system, to psychobiological questions such as emotion, communication, empathy, trust, creativity and joy through to psychological issues such as cognitive development and concentration, and then on to social issues like self-belief, self-confidence, socialisation, motivation and synchronisation....... and so back around the circle to biological concerns. To return to your early career. Even before leaving for Bosnia-Herzegovina, you have described a growing feeling of dissatisfaction with the modernist style with which you were associated. This corresponded with a difficult time following the critical reception of your opera Hell's Angels. Would you describe this time as a point of crisis? I am a modernist and will never stop being a modernist. It is still the most authentic creativity available to us, if we are ready to deal with the many challenges (aesthetic, social, economic, political etc.). I am. My dissatisfaction at the time you mention was not with modernism itself. It was if anything with the betrayal of modernism through mannerism, and related to that, a kind of (at the time) new conformism. When Schoenberg wrote a dissonance, particularly in his earlier works, it was there because he really felt it, from the onset of the envelope to the end of the decay. It had to be there. In his twelve note music he tried to dissipate some of this tension by attempting to eliminate shadows of tonality, but the music still exists in a framework of real technical, emotional and cognitive necessity. If this ever becomes a mannerism rather than a matter of life and death then it has lost its artistic purpose, or has become something else. I also felt that it was possible in modernism to speak in words of one syllable. Modernism is grown up enough to say exactly what it means without hiding behind clever detail and elaborated codes. This does not mean I do not enjoy complexity. I do very much, when it is artistically necessary. I am credited with inventing the term "new complexity" - and I am proud of it. In fact, things have changed a lot since the times you refer to. A new generation explores new spaces between popular and so-called serious art and within multi-media technologies. I feel very close to this generation. If anything the modernist establishments have become weaker than they need be. It is simply a time for people who care about musical invention to stick together. I am not sure to what extent the negative criticism of my work is linked to musical language. It has often been as much to do with, for example, the kinds of theatre I am interested in, and of course I don't claim to be perfect anyway! In the mid 1980s it was probably simply my turn and my time to be clobbered, in the time-honoured British manner. Hell's Angels was, for a number of reasons, a superb sitting duck, or Christmas turkey for them. Some of these things are self-fulfilling prophesies. It is very straightforward. If you get bad reviews, you lose work. In my case the negative criticism continued, and I lost almost all of my work. Even now, I find it very difficult to get opera and music theatre works put on in the UK. I am sometimes invited to arrange rock and roll and jazz for symphony orchestras (which I enjoy hugely) but I am rarely invited to compose for orchestras in my own country - in fact I have been asked once in the last 30 years. It means I have to work elsewhere. I did not "run away", I followed my work and followed my star. In the meantime, as all artists should from time to time, I have re-invented myself. I am very happy with my special musical life, and feel very lucky and blessed to have it. I feel no bitterness whatsoever (that is sudden and total death for an artist). In fact these days I find myself energetically defending music criticism. It is an important part of our artistic life - even the destructive bit. "In spite of everything...I will take up my pencil, which I have forsaken in my great discouragement, and I will go on with my drawing." A writer's heart, a poet's heart, an artist's heart, a musician's heart is always breaking. It is through that broken window that we see the world..."
Did you also feel, perhaps, that what you were doing lacked immediacy and practical application? You have occasionally expressed an almost off-hand view of the usefulness of your own music - your humanitarian work, on the other hand, has a concrete, tangible purpose. Further to this, how would you say your experiences in Sarajevo and afterwards have affected your life as a composer? If I may I would like to answer these two questions as one. I still hold to what you call my "off-hand" view about my work. I still believe we have too much clutter and too much debris of ego and commerce - coffee table "masterpieces" and necrophiliac box sets We also have really not-very-interesting, massively-hyped stuff taking up a huge amount of space and resource. I am simply trying to show that you don't have to be like that. Art is rock and roll. Bach did not sit down like in some Hollywood movie and pompously craft masterpieces for posterity. He lived by the creative moment. And Ed Sheeran is a wonderfully talented man but he is not God (or even, in the immortal words of John Lennon, Jesus). Let's leave some room. Let people of the future, not dead-beat marketing offensives, decide what our culture is going to be. I realise that what I am asking for here means a complete re-structuring of our arts world, music industry and corporate and social media - let's do it. The experience of Sarajevo, and various challenging situations since have had the opposite effect to what people might expect. In these situations I have learnt how very important art and culture are. When the electricity goes off - no computer, no phone, no Twitter feed - and you have too little to eat and you feel sad and afraid, your city is destroyed, your house is broken and your friends are dead - Ladybird, Ladybird, fly away home - all that is left is your culture - the culture you carry in your mind and body. Suddenly, when you are surrounded by this kind of destruction, it starts to matter a lot if someone puts one note together with another beautifully. Making art means more than creating an object or an experience. It is an act of social empathy. I meant what I said at the BASCAs presentations. If someone in the magic of a moment puts real beauty or meaning into the world - it shoots out into the universe and has the capacity to change everything. What is the physics of this? Is it the entrainment of bio-feedback frequencies? The power of pre-cognition? The reversing of entropy? Whatever the case, the social and moral science of all of this is completely obvious. Someone behaves in a humanly creative way, and we are all better off. It is part of what makes our creative work with children so successful. I am just at the crossover point of having finished a number of pieces and about to start the next tranche. I have just finished a piece called I am Swimming for CoMA. It is for volunteer players and choir and is performed together with a movie made by my long-time collaborators, film-maker Samir Mehanovic and editor Laura Carreira. It tells the stories of refugees, with original footage from the Middle East, Balkans, East Africa and Myanmar. I have also just finished a short piece for the Hebrides Ensemble which is an adaptation of a scene from my opera Naciketa, with libretto by Ariel Dorfman. In humanitarian work my focus is very much on Lebanon and Syria. I have also been lobbying Westminster. Our highly-respected NGO is not allowed to open a bank account in the UK. We are responsible for 150,000 refugees and urgently need to access funds from Britain. It is all connected to inadequate national and international sanctions legislation (together, no doubt, with a dose of Trumpish terror-paranoia). On a happier note, I have been negotiating with colleagues in Osijek in Croatia, with the prospect of creating a regional centre for the special education hub and network we have set up in the region. I am preparing to make a virtual reality film of a piano in a Burmese jungle, which will accompany a forthcoming CD of my piece The Piano Tuner to be issued by Delphian records and Hebrides Ensemble in June. I am also making an opera film with Ulysses Theatre and Paradiso films on a set of interwoven spy stories. The film will be a hybrid of cabaret and cinema. We will do the next phase of filming in Istria in August. I am collaborating with Opera Circus on possible performances of my opera Naciketa, maybe in 2019/20 and I shall be working for the city of Matera in Basilicata, Southern Italy supporting the local community in the creation of an opera which will be at the centre of their European City of Culture celebrations in 2019. I am also writing a joint composition with Peter Nelson and Owen Underhill - a dance piece for percussion, part of choreographer Henry Daniel's Contemporary Nomads project, to be performed in Vancouver in September, and a piece elaborating financial structures and the need to search for balance between making culture and making money for the Khazanah investment company in Kuala Lumpur in October. Insightful words... I agree that music, particularly making music as a group, can be a healing experience on many levels both physically and emotionally for those who have experienced trauma.